“Reparations” artist Natasha Marin leads a movement to celebrate “black joy” in her latest exhibit. The poet and conceptual artist Natasha Marin wants to start a black revolution. Not the kind that involves weapons and war. Hers involves joy and peace. In my introductory social-justice column on Sunday, I described justice as the ultimate form of grace, an honor and respect that a society bestows on its members but one that is too often withheld from African Americans and other groups that face enduring discrimination. After getting to know Marin, I’m realizing that the counterpart to that kind of justice is the justice we grant to ourselves. Marin is a 39-year-old from Trinidad who was raised in Canada and is now a U.S. citizen living in Seattle. She’s the woman behind the hugely viral art project called “Reparations,” a 2016 Facebook experiment in which she invited people of color to make requests for things they needed in order to feel better, be happier and be more productive and where white people could contribute funds or other support to fulfill those requests. It was a provocative harnessing of social media to build understanding, address inequities and help restore our faith in humanity. Marin isn’t content with the notion of simply going to a gallery to view beautiful things. In many of her performative works, the viewer is also an essential element in the installation. Our identities, our histories and our potential for growth and community-building are all on display. Two weeks ago, I attended the opening of Marin’s latest collaborative exhibit, “Black Imagination: Ritual Objects” at Virago Gallery in West Seattle. It was a transporting experience, because that’s how this fearless yet disarmingly ebullient artist does things. This is the third phase of Marin’s “Black Imagination” series focusing on the different ways African Americans like herself can find inner peace, healing and “black joy,” without regard to the actions or gaze of the broader white majority. She’s also enlisted 33 contributors to make meditative posts on Instagram depicting their joy along with the #blackjoy hashtag. To understand black joy, you first have to understand that for many African Americans, myself included, happiness is not just a sensation; it’s an achievement. It’s a hard-won form of overcoming that can be so fleeting that your mind swings back into worry, struggle, anger, sadness, grief, disillusionment and anticipation, what the writer James Baldwin described as the “ancestral, daily, historical truth of Black life in this country,” before your body has a chance to absorb that lightness of being. When I speak to Marin in the days before the opening, we both lament that achieving joy is difficult, and even underappreciated, among African Americans, that stress covers us like skin. Maybe that’s what makes our moments of outward happiness seem so cathartic, so revolutionary. Black joy is so potent you could bottle it and sell it like medicine. But we tend to withhold it, even from ourselves. 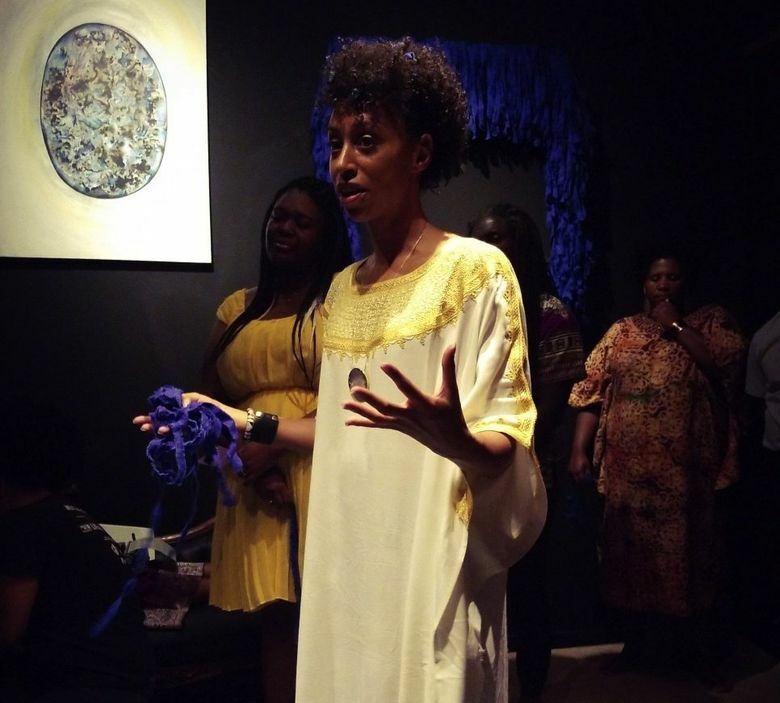 Marin designed “Ritual Objects,” which runs through Sept. 2, as a healing incantation ceremony geared toward African Americans and like-minded people of color, itself a novel idea in a city with a small black population. This wasn’t your typical wine-and-cheese reception. Dressed in a white priestess gown, she welcomes two dozen of us one by one, giving each of us a note card with a positive saying that we are to repeat out loud and nonstop, no matter how uncomfortable it might feel. We crowd into a small and stuffy exhibit room that’s decorated with vibrant strips of blue fabric. By the end, we are two dozen voices chanting different affirmations, bathing ourselves in a joyful noise. My card reads, “I am the epitome of love and grace — my ancestors’ joy lives on in me.” I say it so many times I lose count, but I feel a shift. At the ceremony, we tell each other what makes us feel joyful and lay hands on each other’s shoulders, transcending the troubled waters that flow through our shared history, if only briefly. On the back wall are colored-glass bottles of “Black Joy” that Marin and her 14-year-old docent daughter Roman O’Brien will sell to visitors. They are empty, save for the joyful thoughts that Marin’s specially chosen collaborators have imbued them with. I buy an orange bottle “filled” with joy by the Kentucky-based poet Bianca Lynne Spriggs. No justice, no peace. I keep thinking about these profound words, spoken in protest against so many forms of wrongdoing, as I chant. I’m not so naive as to think that a single evening of joy can right the historical and present-day wrongs suffered by an entire people. But the joy we captured in that crowded room, like lightning in a bottle — that lives on in me. “Black Imagination: Ritual Objects” runs through Sept. 2 at Virago Gallery in West Seattle, 4537 California Ave. S.W., www.viragogallery.com, 206-933-2444. The gallery is open Monday-Saturday, 11 a.m. to 6 p.m., and Sunday, 11 a.m. to 4 p.m. Artist Natasha Marin and her daughter Roman O’Brien will be on hand to greet visitors most weekdays from noon to 4 p.m. All are welcome.